WW1 Reenactments Equipment : Great War Tommy WW1 Food Rations Labels : High Grade Californian Apricots, pre-1917. 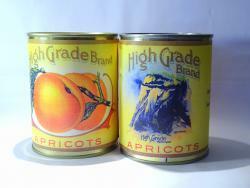 WW1 Reproductions and WW1 Reenactors Equipment / Kit - High Grade Californian Apricots, pre-1917. "High Grade" Californian Apricots, pre-1917. "High Grade" Californian Apricots packed by the Sacramento Packing Co. This brand's labels features the 'Cape Horn' high level gradient on the Central Pacific RR over the Sierra Nevada completed in 1868.